Time after time, I find that an ambitious goal combined with an equal willingness to suffer optimizes personal reward. I’ll admit this statement doesn’t feel true during my adventures, but is clear afterwards. Of course, larger goals lead to larger rewards; but, overly large goals, exceeding my willingness to suffer, lead to bitter disappointment. And, naturally, small goals accomplished easily mean nothing. My trip to RMNP to collect the summits of Chief Head (13,579′) and Mt Alice (13,310′) was aggressive for obvious and non-obvious reasons. In success, I found tremendous satisfaction, even if some of the suffering was self induced. Still, I managed to get ready to meet Brian and then drive to the Glacier Gorge trailhead before 6am. As I tied into my new La Sportiva Eigers, which just replaced my old Makalus, I silently hoped wearing them around the house for a couple days the previous week was enough to break them in. We started hiking right at 6am and made good time until the battle between my feet and my new boots began to resolve itself into a win for the boots. By 8:45am I reached Black Lake where I performed my second boot/sock refit of the day. Afterward, we left Black Lake for the shortcut to Stone Man Pass, aiming directly for Arrowhead. We scrambled up the steep grass and cliffy slope, and reached the bench above Black Lake just in time for a boot pit stop. In a blatant escalation of hostilities, I dug out the moleskin and athletic tape, and hoped for a stalemate. We then turned south to head underneath McHenry and to Stone Man Pass. Below McHenry, we stopped at a waterfall to refill our bottles. This would be our last water source until returning to the spot hours hence. Brian had his usual thimble-sized container, while I brought a surprisingly modest two 1-liter bottles. To compensate for a dry future, I finished and refilled both liters before heading up the partially snow-clogged couloir to Stone Man Pass. A view back down the ridge toward Stone Man Pass. 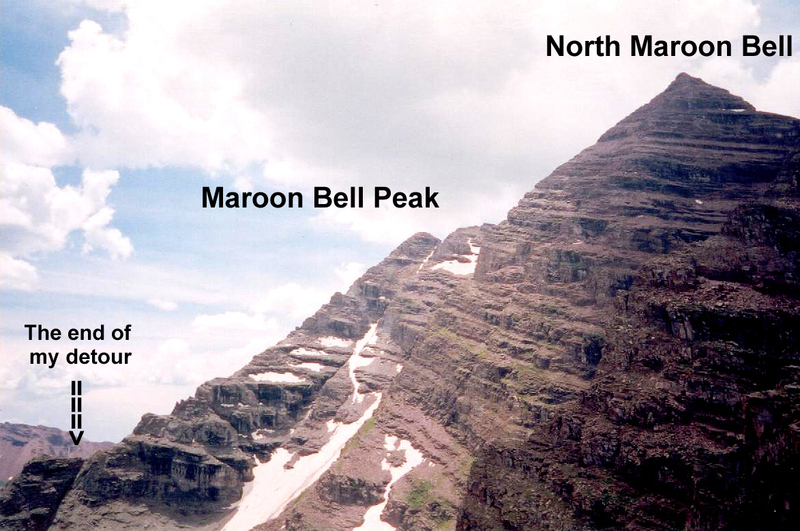 The route starts from the top of Stone Man Pass. 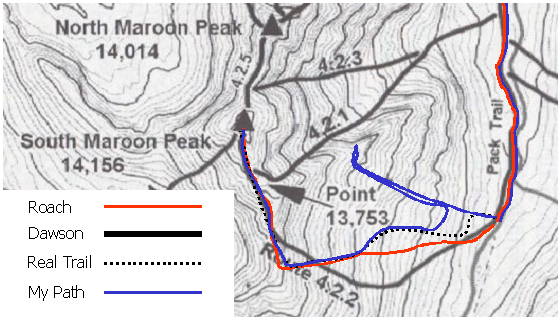 We reached Stone Man pass around 10:30am and examined the ridge leading up to Chief’s Head for clues about the route. 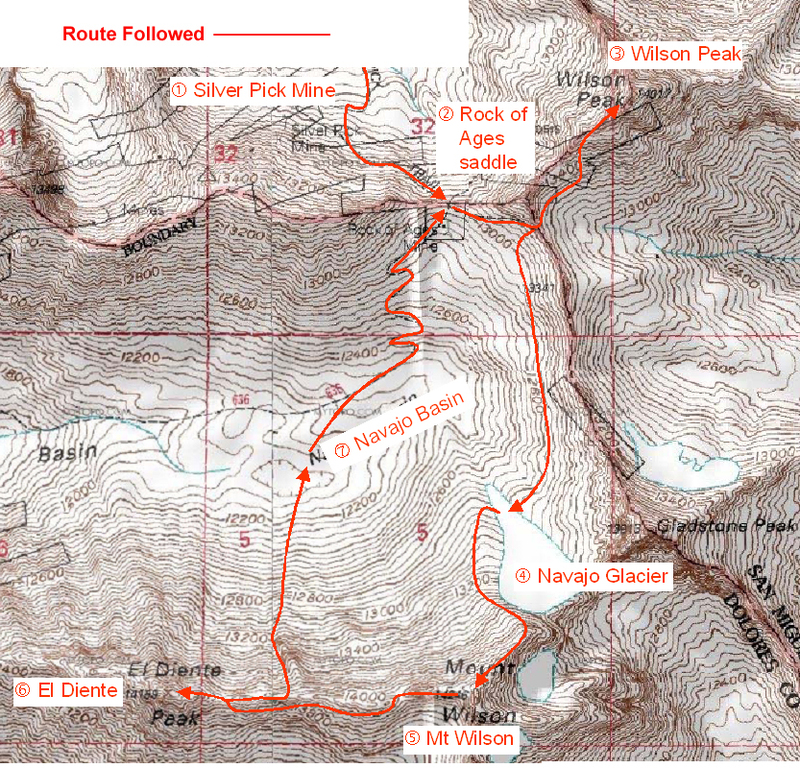 The available guidebooks were not very clear about the exact route to Chiefs Head. I have found that this can mean the route is obvious or, alternatively, it could mean nothing at all. We took another 2 minutes to study the Stone Man himself for possible future climbing; Brian assessed it a “five-easy” while I thought it looked hard to protect. Brian is often right about these things and we made a mental note to give it a try another time. 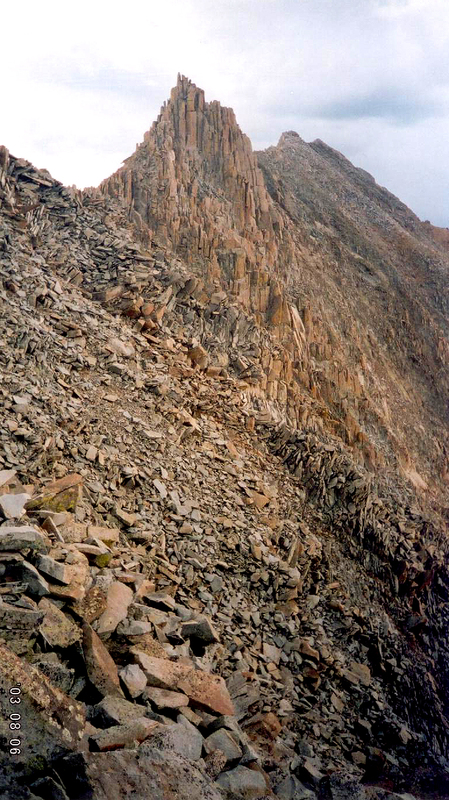 Note: a later trip confirmed the climbing is easy but awkward; however, a safe escape from the Stoneman’s head required the sacrifice of a long cordelette. The route finding quickly became very interesting. 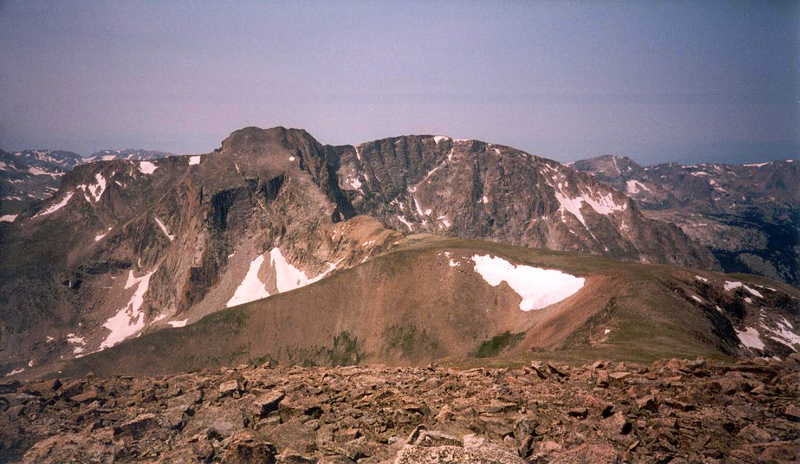 I spied a lonely cairn 90 degrees west (right) from where the route looked to go up a couloir to the ridgeline. Brian went to investigate while I resorted my boots again. I feared for torrents of blood pouring out of my boots each time I took them off. 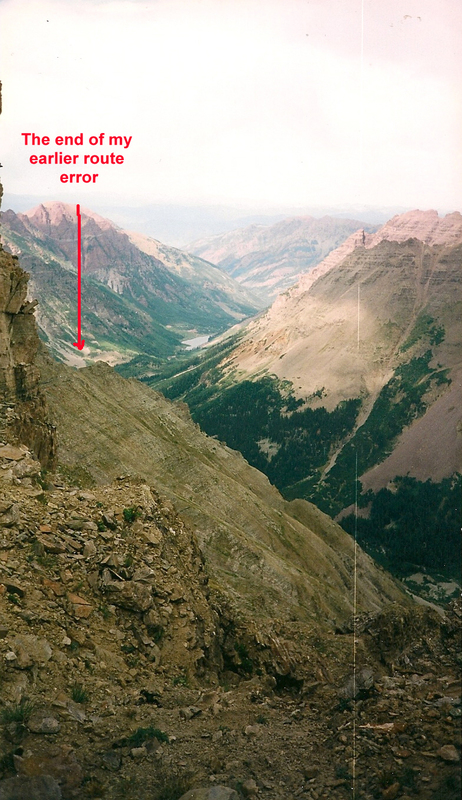 We continued scrambling below the ridgeline on the west side along a ledge until we reached the end of the ledge. 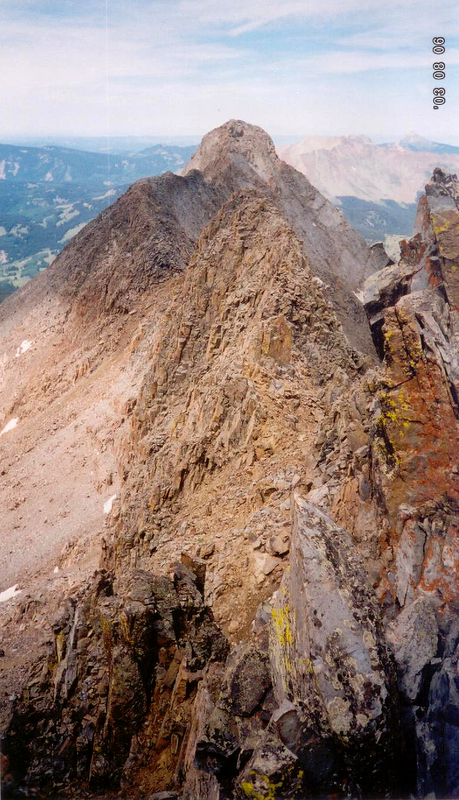 Then we took a hard left through a “keyhole” of sorts, and climbed up to the summit ridge of Chief’s Head. It was very good rock and a pleasant scramble (3rd class). We reached the summit ridge at 11:15am and took another 30 minutes to ascend the remaining 700 feet of elevation to the Chiefs Head summit. 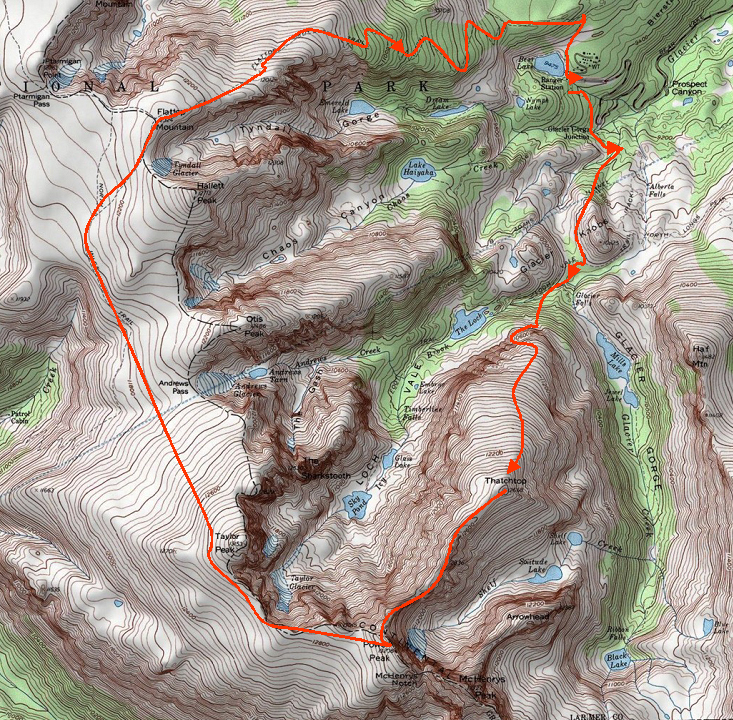 This last 700 feet consumed the last of my “still feel strong” status. We stopped for lunch, during which I consumed ½ of the water that would have to sustain me until I return to the bottom of Stone Man Pass. I was 1.75 hours into a 5-hour circuit and my water was ½ gone. I also made another futile attempt to save my feet, and resolved to go barefoot if the pain got worse. The views from Chief’s Head are worth the trip. 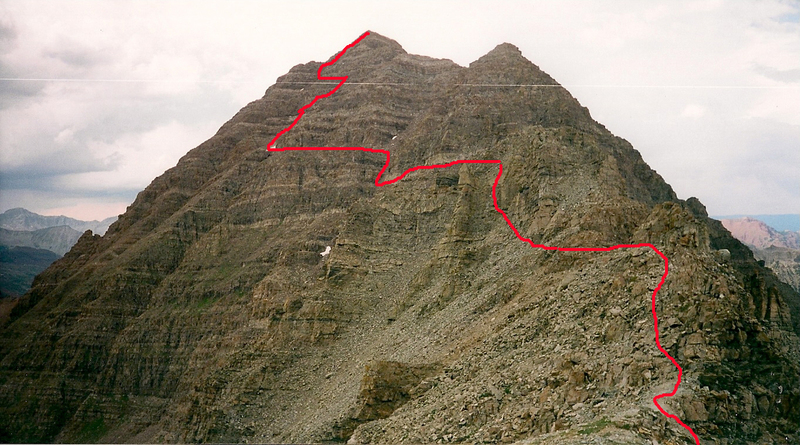 The line from Meeker to Longs to Pagoda to Chiefs Head is spectacular. 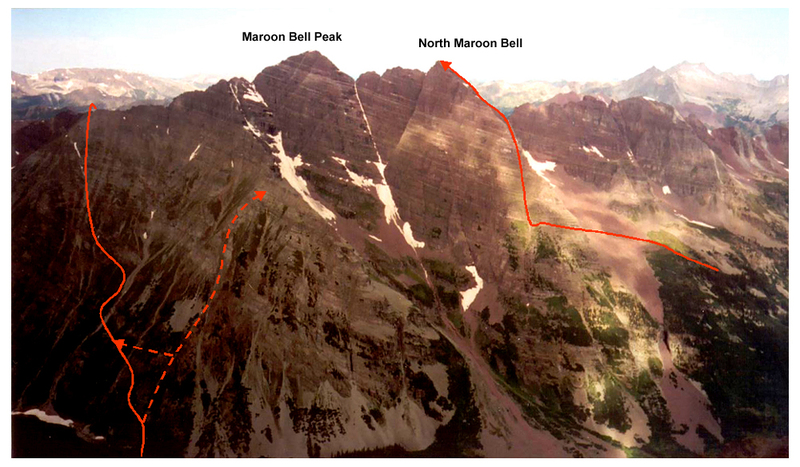 The thought of doing the entire traverse appealed to my ego, but I concluded it would require too much suffering. 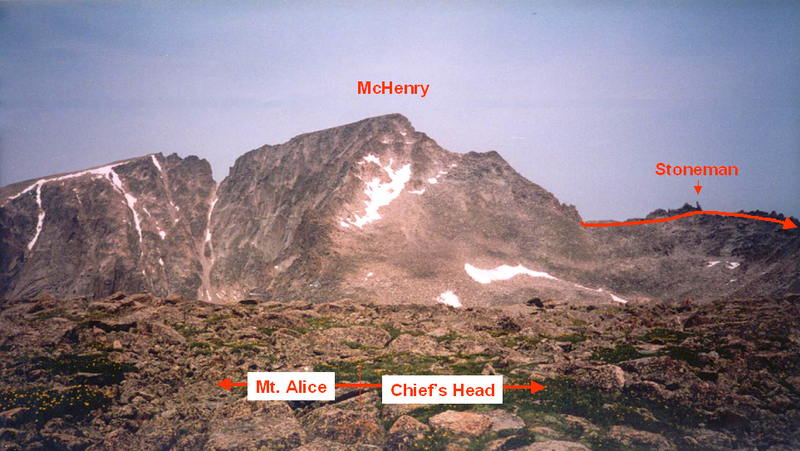 As I looked over toward McHenry, I joked that if we felt like it we could climb McHenry again to claim the Triple Crown (Gerry Roach’s title for bagging McHenry, Chief’s Head, and Mt. Alice in a day). Brian just grumbled as he had done every other time I mentioned the possibility in the previous 24 hours. Somewhat refreshed, we started down the talus boulders making very good time to reach the grassy field that lies between Chief’s Head and Mt. Alice. We were approaching Mt. Alice when, looking back, we noticed a couple of people behind us about ½ way across the grassy field coming toward Mt. Alice as well. We were surprised and wondered how they had gotten so close without us noticing. Looking back a few moments later, Brian noted they had gained a lot of distance on us. I reasoned that they were traveling downhill while we where doing a bit of scrambling and climbing. It seemed like a reasonable conclusion. 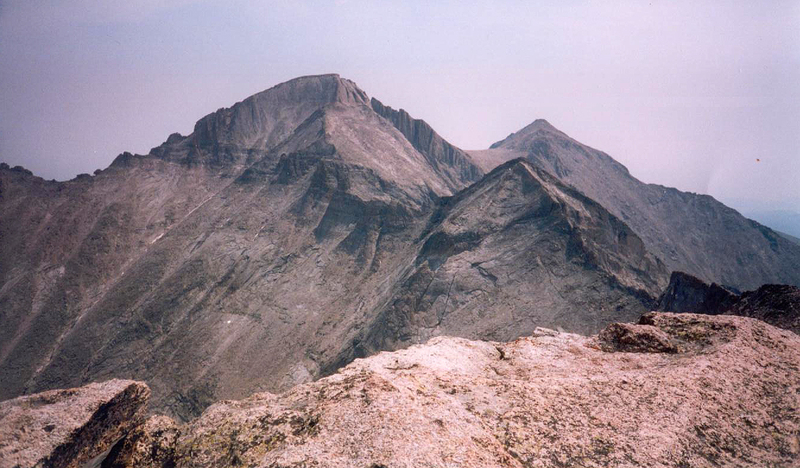 A view of Mt Alice and the narrow ramp summit route from below the summit of Chiefs Head. Over the next 30 minutes, these fellows proved that people are not all the same. They must be young, I thought. The first to pass me was a young fellow, but his partner right behind him looked like my father. Brian strained to beat the old guy to the summit, marginally holding up the honor of the team. When I arrived at 1:30pm, they were gone. 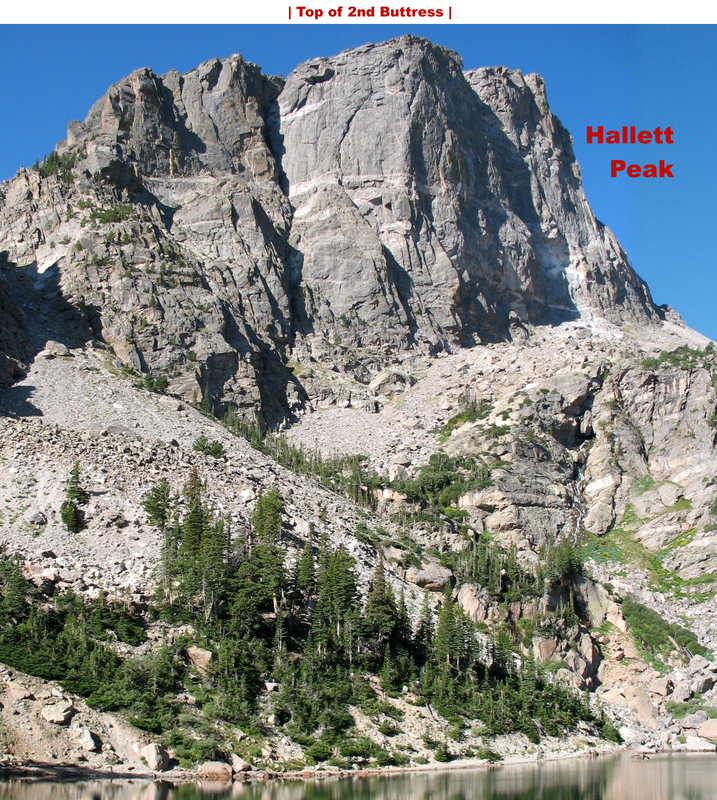 As I looked around, Brian indicated that they had gone on to grab more peaks before heading back to Wild Basin. They had done Meeker, Longs, Pagoda, Chief’s Head, and Mt. Alice (so far) in shorts and sneakers. The older guy had said he was tired, while the younger guy said he was running out of food because he didn’t have bread to make peanut butter and jelly sandwiches that morning. Poor guy. After a short snack and another boot repair, I was out of water. I was tired and 9 miles from the car, but at least I was turning around. I managed to get back to the grassy field in decent time; downhill is always okay. But climbing back up to the Chief’s Head ridge was murder. And my body didn’t work that well anymore, forcing me to think carefully about moves that I did unconsciously a few hours earlier. I really needed some water. We reached Stone Man pass at around 4:30pm, which left us 4 hours of light to get down the snow/talus slope below Stone Man Pass, get over to and down the steep trail west and above Black lake, and then hike 4+ miles to get to the car. We didn’t even talk about McHenry. We descended the snowy Pass with a bit of heel plunging and a bit of scrambling to reach the bottom by 5pm. I found a nice fountain of melted snow to refill my long-empty bottles; but I had to wait 30 minutes before drinking to allow the iodine to work its magic. I was very tempted to throw caution to the wind and just drink it. Thirty minutes later, I yelled to Brian to stop. I was going to have that damned water right then. As I was pulling my water out of the pack, I nearly trembled with fear as I lifted the 1st bottle up to the light . . . It was not dissolved. The damned thing looked just like it did when I put it in there. As I was losing my composure, Brian reminded me that hiking equals shaking, in the world of iodine tablets. I started hiking without taking a drink. We scrambled down the steep slopes above Black lake with a bit of rock scrambling and steep grass maneuvering. The plan was to stop at Black lake for a break, but once I was past the hard part of the descent, I just sat in the dirt and drank a liter of water. That was good water; even the iodine tasted good. I then joined Brian at Black lake where I finished off another liter and a bar, and then I refilled one of the bottles for the ride home. I didn’t even bother with the boots any more. I was just stumps below the ankles. On flat terrain and using good trails, we took less than 1.5 hours to cover the 5 miles to the car, arriving at 8pm. I finally was able to get those miserable boots off my feet. I didn’t have the courage to examine the damaged tissues so I just put on my sneakers, drank my iodine water and started driving. Driving home, it started to feel like a day well spent. 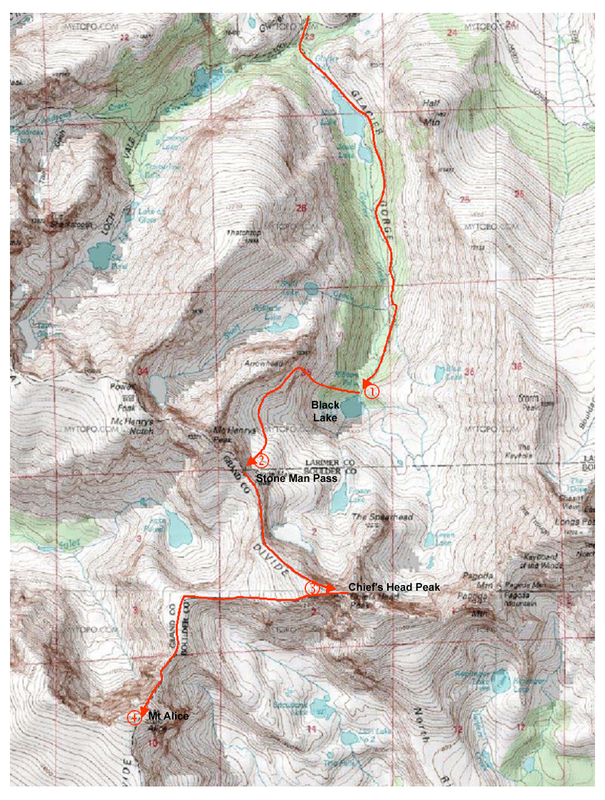 The pleasure of our successful 14 hour effort to hike 18 miles and climb 5,300 feet to reach the summits of two new 13ers spread throughout my body like a slow, warm wave. My feet almost didn’t hurt anymore. Almost. Our trek to bag Chiefs Head and Mt. 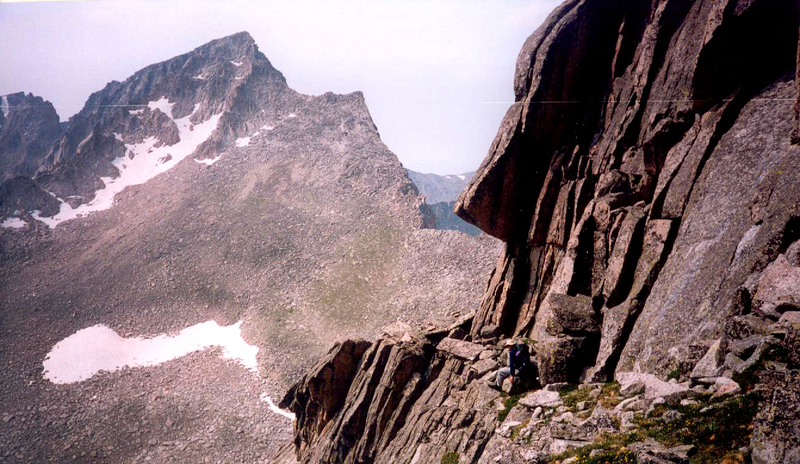 Alice in RMNP was another of those harder-than-expected- but-glorious-in-its-successful-completion efforts. It was perfect.